Lesson learned, never rule out anything unless you've tried it once. I am still hesitant about florals but I don't mind this type of large, floral, rock an roll-ish print...the main reason why I bought this was becasue it sort of reminded me of the shirts Keith Richards, Steven TYler and Stevie Nicks used to wear. Having florals in this style makes it a lot more versatile. It allows me to style it into something edgier with boots, bell bottoms and heavy metal (excuse the pun) or like this...which I find more appropriate for an afternoon out with Mamita. She doesn't really approve of the previous styling I mentioned and you don't exactly want to find yourself on her "bad side". The conversation about your said outfit will go on and on for the entire afternoon complete with disapproving looks scattered conveniently here and there. :P She makes me feel like a child again sometimes...which I now appreciate and miss. Amazing outfit!! Your hair is literally so great, that color is so pretty!! I can't stop admiring your hair, Sarah! So cute! 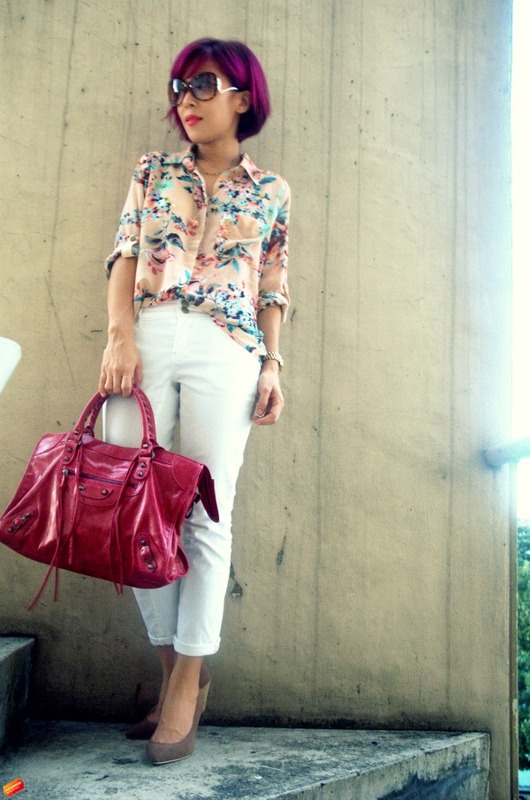 I love the floral blouse and your hair is so cute! Love the color and the cut!